What Kind of Jobs are Being Created? As we talk more and more about job creation, one question that keeps popping up, right along with, “how do you do it?” is “what kind of jobs will be created?” What jobs will eventually replace the millions that were lost in the recent recession? If recent statistics are any indication, it looks like we are more than ever gong to be a service economy. During this past month of March, employment in the service-providing sector continued to expand, led by a gain of 78,000 in professional and business services. 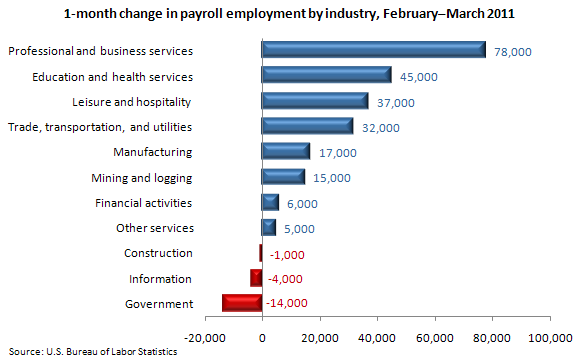 Health care employment, which is part of education and health services, continued to increase in March (+37,000). Over the last 12 months, health care has added 283,000 jobs, or an average of 24,000 jobs per month. Employment in leisure and hospitality rose by 37,000 over the month, with more than two-thirds of the increase in food services and drinking places (+27,000). Manufacturing employment continued to trend up in March (+17,000). Job gains were concentrated in two durable goods industries—fabricated metal products (+8,000) and machinery (+5,000). Employment in durable goods manufacturing has risen by 243,000 since its most recent low in December 2009. Employment in mining increased by 14,000 in March, with much of the gain occurring in support activities for mining (+9,000). Employment in local government continued to trend down over the month, declining by 15,000 in March. Local government has lost 416,000 jobs since an employment peak in September 2008. Will jobs continue to come from business service and health care? And as local governments in more and more financial distress continue to slash their budgets, will many of the jobs created just be offset by public service workers who lose their jobs? At least these numbers show a net gain, and I guess right now, that’s the most important thing.